North Korea has test-fired at least six missiles, including a long-range Taepodong-2, despite repeated warnings from the international community. US officials said the Taepodong missile - thought capable of reaching Alaska - failed shortly after take-off, while the others fell into the Sea of Japan. The US called the tests "provocative" and Japan has announced sanctions. The UN Security Council is due to hold an emergency meeting later on Wednesday to discuss the developments. The closed UN session was requested by Japan, which said it was co-ordinating its response to the missile tests with the US and other countries. Japanese and South Korean military are on high alert in the wake of the tests, and share prices have fallen in both countries. Australia said it expected North Korea to make further test firings. In the US, White House spokesman Tony Snow said the launches "demonstrate North Korea's intent to intimidate other states" and Washington would take necessary steps to protect itself and its allies. President George W Bush is sending Assistant Secretary of State Christopher Hill out to the region. Japan - one of North Korea's harshest critics, and in easy reach of a long-range missile - announced bans on the entry of North Korean officials, chartered flights and a ferry. In South Korea - which has been anxious to promote reconciliation with its unpredictable northern neighbour - the government called an emergency cabinet meeting soon after the tests took place. South Korea has consistently opposed the imposition of sanctions, but in recent days it warned of cutting food aid to the North should the missile tests go ahead. Analysts said the firing - North Korea's first test of a long-range missile since a self-imposed moratorium in 1999 - would also seriously damage prospects for stalled international talks on the North's nuclear programme. According to US officials, the North fired at least six missiles over a four-hour period, beginning at 0332 Japan Time (1832 GMT). South Korea has confirmed that five of the missiles were medium-range versions of the old Soviet Scud missile. 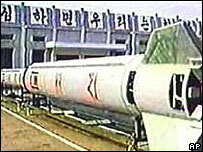 The sixth was the long-range Taepodong-2, fired from the Musudan-ri missile base. The Taepodong-2 crashed 42 seconds after it was launched, according to US sources. The US and North Korea's neighbours have been on heightened alert in recent weeks amid suspicions that Pyongyang was preparing to launch the Taepodong-2, which has a range of up to 6,000 km (3,730 miles), putting parts of the US within striking distance. Long-running talks over North Korea's nuclear capabilities have stalled, with six-party negotiations on the issue being repeatedly postponed as neither Washington nor Pyongyang are prepared to give ground. North Korea may see this action as a way to get attention and break the diplomatic log jam, our correspondent adds. The tests came as the US celebrated its Independence Day holiday and launched the space shuttle from Florida.